Difference between revisions of "Brandt, John K (1891-1972)"
Johann "John" Kornelius Brandt: teacher; born 3 September 1891 in the village of Wasilovka, [[Naumenko Mennonite Brethren Church (Kharkiv Oblast, Ukraine)|Naumenko Colony]], South [[Russia|Russia]]. He was the tenth child born to Kornelius Brandt (14 March 1853, Neu Osterwick, Chortitza, South Russia - 16 February 1920, Horndean, Manitoba, Canada) and Margareta (Rempel) Brandt (21 August 1852, Neu Osterwick, Chortitza, South Russia - 27 October 1923, Canada). Five older siblings had died in infancy. A younger brother also died in infancy, leaving John as the youngest in a family of five. John married Anna Thiessen (2 March 1897, Nikolayevka, Ignatyevo, South Russia - 31 May 1992, Chilliwack, British Columbia, Canada) on 6 April 1919 in Greenfarm, Saskatchewan, Canada. She was the daughter of Johann J. Thiessen (1869-1958) and Anna (Schellenberg) Thiessen (1867-1917). 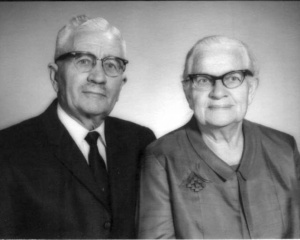 John and Anna had 12 children: Peter, Edwin, [[Born, Henry C. (1920-2002)|Esther]], Herbert, Victor, Elsie, Evelyn, Allen, Eleanore (died young), Ethel, Bernhard, and Gilbert. John died on 27 August 1972 in Abbotsford, British Columbia, where he was buried. Johann "John" Kornelius Brandt: teacher; born 3 September 1891 in the village of Wasilovka, [[Naumenko Mennonite Brethren Church (Kharkiv Oblast, Ukraine)|Naumenko Colony]], South [[Russia|Russia]]. He was the tenth child born to Kornelius Brandt (14 March 1853, Neu Osterwick, Chortitza, South Russia - 16 February 1920, Horndean, Manitoba, Canada) and Margareta (Rempel) Brandt (21 August 1852, Neu Osterwick, Chortitza, South Russia - 27 October 1923, Canada). Five older siblings had died in infancy. A younger brother also died in infancy, leaving John as the youngest in a family of five. John married Anna Thiessen (2 March 1897, Nikolayevka, Ignatyevo, South Russia - 31 May 1992, Chilliwack, British Columbia, Canada) on 6 April 1919 in Greenfarm, Saskatchewan, Canada. She was the daughter of Johann J. Thiessen (1869-1958) and Anna (Schellenberg) Thiessen (1867-1917). John and Anna had 12 children: Peter, Edwin, [[Born, Esther Annie Brandt (1923-2014)|Esther]], Herbert, Victor, Elsie, Evelyn, Allen, Eleanore (died young), Ethel, Bernhard, and Gilbert. John died on 27 August 1972 in Abbotsford, British Columbia, where he was buried. In 1903, the Brandts immigrated to [[Canada|Canada]], staying in [[Gretna (Manitoba, Canada)|Gretna]], [[Manitoba (Canada)|Manitoba]] until 1905. That year the family moved to a new settlement in Lichtfeld, Saskatchewan, near [[Herbert (Saskatchewan, Canada)|Herbert]], where Kornelius Brandt bought some land. The Johann Thiessen family arrived on the same ship and also settled near Herbert. Anna, one of the Thiessen children, later became John Brandt's wife. They were married 6 April 1919 in Greenfarm, Saskatchewan. Johann "John" Kornelius Brandt: teacher; born 3 September 1891 in the village of Wasilovka, Naumenko Colony, South Russia. He was the tenth child born to Kornelius Brandt (14 March 1853, Neu Osterwick, Chortitza, South Russia - 16 February 1920, Horndean, Manitoba, Canada) and Margareta (Rempel) Brandt (21 August 1852, Neu Osterwick, Chortitza, South Russia - 27 October 1923, Canada). Five older siblings had died in infancy. A younger brother also died in infancy, leaving John as the youngest in a family of five. John married Anna Thiessen (2 March 1897, Nikolayevka, Ignatyevo, South Russia - 31 May 1992, Chilliwack, British Columbia, Canada) on 6 April 1919 in Greenfarm, Saskatchewan, Canada. She was the daughter of Johann J. Thiessen (1869-1958) and Anna (Schellenberg) Thiessen (1867-1917). John and Anna had 12 children: Peter, Edwin, Esther, Herbert, Victor, Elsie, Evelyn, Allen, Eleanore (died young), Ethel, Bernhard, and Gilbert. John died on 27 August 1972 in Abbotsford, British Columbia, where he was buried. In 1903, the Brandts immigrated to Canada, staying in Gretna, Manitoba until 1905. That year the family moved to a new settlement in Lichtfeld, Saskatchewan, near Herbert, where Kornelius Brandt bought some land. The Johann Thiessen family arrived on the same ship and also settled near Herbert. Anna, one of the Thiessen children, later became John Brandt's wife. They were married 6 April 1919 in Greenfarm, Saskatchewan. Although John took the opportunity provided through the government to purchase land inexpensively, he was not a farmer at heart. He longed to be a school teacher and therefore sold his land, packed up for Gretna, Manitoba where he studied at the Mennonite Collegiate Institute. From there he went on to the University of Saskatchewan, Saskatoon, for teacher training. For the first year of teaching, John was in the Lowe Farm School District. His parents wanted him to teach in Greenfarm, and in 1918 he obtained a position in that district. An added benefit was the invitation to board with the Johann Thiessen family. After one year, John and Anna were married. Not too long after the Kornelius Brandt family moved to Saskatchewan, John made a commitment to Christ and later was baptized and joined the Mennonite Brethren Church in Greenfarm. Following Christ became a significant part of John Brandt's life, and church involvement was a natural outgrowth of this commitment. John Brandt taught for 31 years in several school districts in Saskatchewan and then also in Manitoba. Along with teaching the usual subjects, Brandt always pursued his musical interests and led school choirs, bands and/or orchestras. In 1947 the Brandt family moved to Chilliwack, British Columbia. Here John again bought a farm, expecting his sons to farm. However, neither he nor his sons relished farm life. Soon an opportunity to teach in a Bible school arose, and John was glad to become involved. For a number of years he taught in the East Chilliwack Bible School and also at the South Abbotsford Bible School (the forerunner of Columbia Bible College). Teaching music and directing choirs was a source of great joy for John. John Brandt's music involvement went beyond teaching in school. Wherever the Brandts were involved in church, John directed the choir and participated in other musical roles. Because Bible school teaching was not full time in those earlier years, he worked at a variety of jobs to provide for his family. John and Anna Brandt moved to Abbotsford (Clearbrook) in 1957. Here they lived, first in semi-retirement, and then in full retirement, until John's death in 1972. In 1968 the Brandts celebrated their golden anniversary, reflecting on the many gifts received from God. John remained active in a variety of church activities until poor health forced him to retire completely. On 27 August 1972, John succumbed to cancer and went to be with his Lord whom he had served and honored throughout his life. Brandt, Gilbert G. "Brandt, John K (1891-1972)." Global Anabaptist Mennonite Encyclopedia Online. September 2002. Web. 23 Apr 2019. http://gameo.org/index.php?title=Brandt,_John_K_(1891-1972)&oldid=126940. Brandt, Gilbert G. (September 2002). Brandt, John K (1891-1972). Global Anabaptist Mennonite Encyclopedia Online. Retrieved 23 April 2019, from http://gameo.org/index.php?title=Brandt,_John_K_(1891-1972)&oldid=126940.